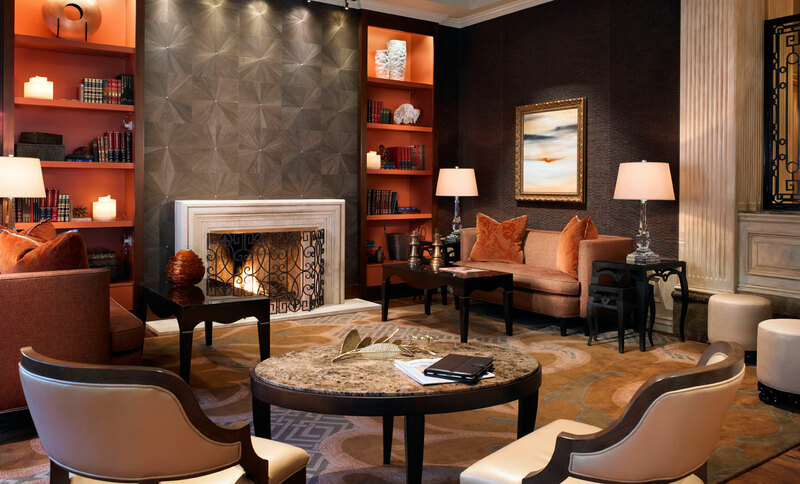 Long a social magnet for cultured Houstonians, with the renovation of its guest floors the St. Regis has become a natural extension of the gracious River Oaks homes of Houston’s elite. 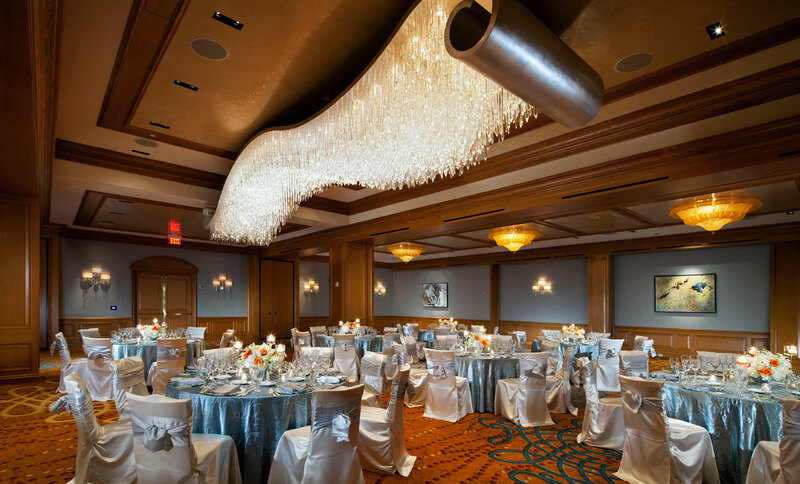 The newly transformed guest rooms, suites and corridors reflect the sophistication and glamour of Houston, a look that can be called “boots and diamonds”. In keeping with St. Regis’ description that the design of its hotels reflect “exquisite eccentricity”, the newly designed guest accommodations exude a casual elegance with a decidedly upscale Texas sensibility. 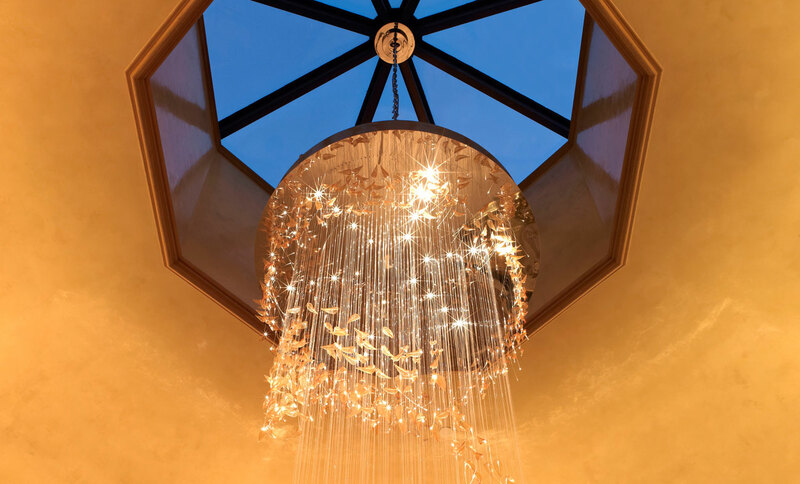 ForrestPerkins transformed the Presidential Suite at the St. Regis Houston, creating the city’s most elegant accommodation for elite world visitors and prominent dignitaries. The residential style of the suite includes a full kitchen with luxury appliances, a large dining room with a round table and generous seating for eight, a generous study and a separate bedroom for guests. The terrace overlooks the city. The living room has a working fireplace and inviting seating. In the master bedroom, generous custom made night stands topped with elegant Venetian glass lamps, a chaise longue and a dressing table create a refined private sanctuary. The large walk-in closet and the commodious six fixture bathroom have floor to ceiling windows with dramatic views. A television is concealed in the large mirror above the double vanity. Colors for the Presidential suite are soft creamy neutrals, with verdant green and spice tones added to the living areas. Custom hand woven wool rugs grace the polished wood floors in the living, dining and study and the entry features a stunning inlaid parquetry wood floor and hand made wallcovering. Fabrics throughout are woven from natural fibers such as silk, wool and linen. ForrestPerkins custom designed the bedding and bed drapery to further elevate the sense of a luxurious penthouse residence. 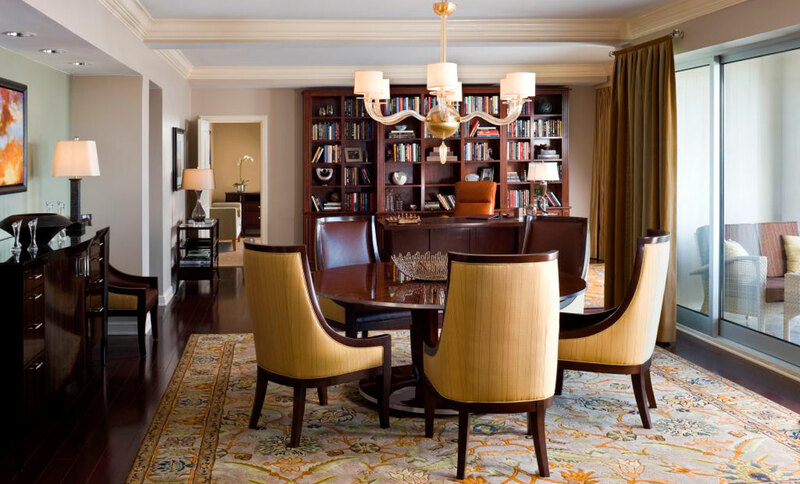 ForrestPerkins redesigned the elegant five bay Royal Suite from a concierge lounge and two adjoining guest rooms to create a suite with a generous living space that comprises a full dining room, large living area and a study. The designers incorporated a full kitchen with luxury appliances and bar to support the legendary butler service for which St. Regis is renowned. Unique to the hotel, the room was designed around three large oriental rugs specifically hand knotted in Afghanistan for this suite in the traditional way by women once forbidden to work by the Taliban. Vegetable dyes create luscious hues of honey, cantaloupe, icy aqua and deep cinnamon that form the basis of the nuanced color scheme throughout the suite. Rich saddle leather graces the dramatic custom headboard in the Master Bedroom. 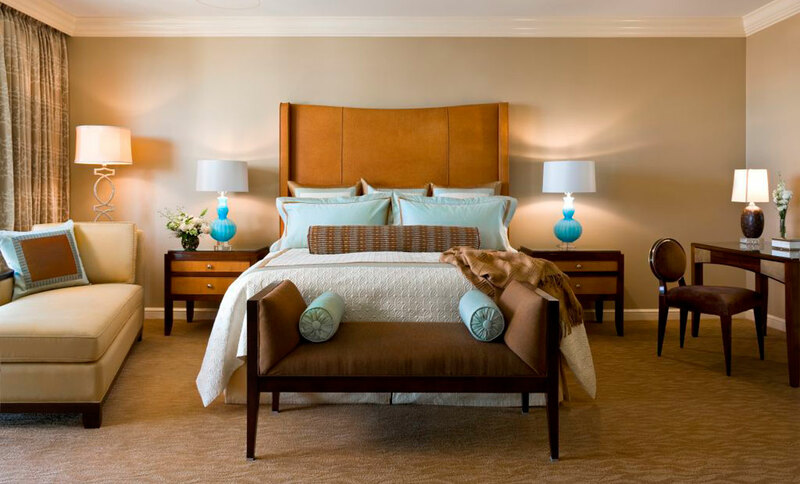 Turquoise Venetian glass lamps provide the “jewelry” that makes this luxurious room a memorable experience. The adjoining dressing room with a walk-in closet leads to a six fixture marble bathroom, the details of which belie the fact that it is fully accessible. There is also an adjoining guest bedroom with equally luxurious appointments. In Texas, everything is larger than life. And the Governors’ Suite at the St. Regis Houston is no exception. What in most luxury hotels would be considered the Presidential Suite, the two Governors’ Suites are a step down from the palatial Presidential and Royal Suites in size but not in quality of furnishings and fittings. Each has hardwood floors, a dining room with ample seating for six and a generous living room, a newly renovated and fully functioning kitchen with luxury appliances, a powder room and two bedrooms. Two custom designed hand tufted rugs in a stylized animal pattern sit atop deeply stained polished wood floors and form the base for a warm neutral, rust and deep green color palette. Upholstery includes leather, wool, silk and cotton fabrics that are sumptuous to the touch. ForrestPerkins added built-in bookcases and millwork flanking the working fireplace, newly surrounded in marble. Each suite features a 50” flat screen television. The master bedroom is designed in warm medium brown with accents of ebony and crisp white. As in the other suites and guest rooms, the headboard takes center stage, anchoring the beautifully appointed bed with tailored leather panels and polished wood wings.